As you know, last month was the annual American Leadership Conference, and once again I was invited as a member of the media. This would be my first flights since being gifted entry-level Gold elite status through May 15 (along with everyone and their mother, apparently), and I was looking forward to seeing the difference between that and traveling as a peon. As any Gold elite already knows, it really wasn’t much different. It certainly hasn’t made me any more interested in actually earning status. I decided to go down to Orange County instead of LAX for this trip. I hadn’t flown out of there in a long time, but I really wanted to try the new Oasis interior reconfiguration on the 737, and American mostly has A321s from LAX. So I booked that and hoped I’d get lucky. After being booked by American, I received the one perk of Gold status that I actually used. I was able to reserve a window seat that was blocked for elites. In other words, I was able to sit a few rows ahead of where I otherwise would have sat. The day before travel, I found I wouldn’t be on an Oasis airplane on the way out, so I looked to see if Main Cabin Extra was available since Golds can reserve for free during the check-in window. There were only middles, so I stuck with the seat I had. I checked in on the app and then showed up a little more than an hour before departure. Security was empty and staffed by absurdly nice agents. (The ID checker was stopping everyone for about 30 seconds asking about their lives.) I went through and then logged in to pass the time while I waited for my flight. My Gold status offer came with ten 500-mile certs, so I had listed for an upgrade, because… why not? I looked at the standby list and it was full with me being number 17 out of 17. HAHAHAHAHA, no. The inbound aircraft arrived 11 minutes late, and boarding began soon after. There were a lot of elites in front of me. By the time I boarded in group 4, I’d say there were at least 30 or 40 people who had already boarded and the line stretched back through the jet bridge. Boarding was painfully slow. We had every kind of annoying traveler in the bunch. One guy was already seated and decided he needed to get up, stop the line, and get something from a bag overhead. Another guy had put his briefcase into the bin, and people kept asking him if he would move it since there was limited room elsewhere. He refused until one passenger wouldn’t give up and finally got him to relent. In my seat, I enjoyed that upgraded interior that will soon be ripped out. Now that Delta has committed to screens in the seat, it makes for a big, visible differentiator. It would mean a lot less if American and United had decided to keep them, but it really does impact the feel of the cabin. We pushed back 10 minutes late and then had to sit and wait due to flow control at DFW. It wasn’t too long and the pilots kept us informed. The flight attendants seemed to be in a good mood, greeted everyone, and had a casually-reassuring way with their announcements. I started watching BlacKKKlansman on the ground, and I was glad I did. It’s a longish movie, and I wasn’t sure I’d make it all the way through if I had to wait to get to altitude. We did the usual launch off the Orange County aircraft carrier and then settled back so all the rich people could enjoy their tea in peace. Once over the ocean, we started climbing again and headed east toward Dallas. The scenery was absolutely stunning for the first half of the flight. The mountain peaks were covered in snow in California but by the time we got over Northern Arizona, it was a winter snowscape all around. Once we got over Texas, the white turned to brown and the chop picked up. The captain said that there was turbulence coming, so he seated everyone and then descended to try to avoid it. It was only light to moderate chop from there. Closer to Dallas we found ourselves in a soupy haze as we came down. The map was completely wrong on our ETA, so my movie ended with plenty of time left. As we got lower, it got bumpier. Winds on the surface were so strong that they had to land on the 31s, the reason for our flow controlled-departure. We took quite the route, heading south between Fort Worth and DFW, then turning east before coming back around by Dallas and paralleling Love Field before landing. We had a great view the whole way in and then we landed on 31L. That runway is so far west that you get the unique sensation of flying high next to the terminals before landing. Unsurprisingly, we had a very long taxi back to our gate. We parked right next to an MD-80. I’m going to miss the only planes with a true silver livery in the fleet once they’re gone. We poured out into the terminal and I headed to my hotel. As you all saw here, Cranky Dorkfest was a big success. The next day was the leadership conference, and that night I stayed up all night with American. If you read those posts, you’ll know I rolled out of that all-night adventure and headed straight to gate C33 for my flight home. Once again, my attempt at getting on one of the new Oasis interiors was thwarted. This plane had the same fancy interior as the way out. When I looked, First was again checked in full and I was somewhere far down the list. Main Cabin Extra had a non-reclining exit row window available, but other than that, it was just middles. I don’t generally like exit rows, but my mind was made up to not move when I saw an empty row of seats behind me on the seat map. I moved myself back to that in the app and hoped for a coach flat bed. Once onboard, I put my stuff up and took my seat. My row ended up having someone in the aisle, so my dreams of a flat bed were thwarted, but at least there was an empty middle. I was seeing double by this point, and I have vague memories of the safety video showing. That’s most of what I remember on the ground. But the sound of the thrust increasing at takeoff woke me up, and I recall watching us clear the low cloud layer before heading into blue skies. I had flipped on a movie when we first took off, but I remember very little of it. I was out like a light. Sadly that lasted only for about an hour or so. Somewhere over New Mexico, the air got choppy. The bounce combined with the seatbelt sign turning on, the captain coming on the PA announcing that we were descending to try to find smooth air, and the descent itself jolted me out of my slumber. The air did smooth out, but I was now firmly awake. I had to go to the bathroom, but the seatbelt sign was left on, so I just passed the time watching the screen. I tried out some of the “calm” station features including a video of waves crashing on the beach, but it didn’t put me back to sleep. Even though the turbulence had stopped long before, the seat belt sign didn’t come off until somewhere over Arizona. I went to the lav, and then I still couldn’t sleep. So, I decided to play with American’s new streaming content on my phone. I looked at the live TV option. It’s nice to have those 12 channels, but there is no guide and you have to open each channel to see what’s on, then close it and re-open another one. It’s a bit clunky, but the streaming itself worked well. Soon enough we were descending, and I stared out my window watching the snowy mountains pass by. Only once we touched down did I get tired again. It was a long day. My summary? The trip was perfectly fine, but Gold really didn’t enhance it very much at all. I’ve never valued elite status, especially the lowest levels, and this certainly didn’t change my impression. I’ll continue to fly the airline that gives me the best option on any given trip. Sounds like Delta Silver status. If the “perk” is basically given away to anyone who can qualify for a credit card – it’s not a perk. Not that I always care to be the first person on board but lower level tiers of “status” really are for vanity only. They don’t make the traveling any better. I’m going to use that from now on as well as my usual “last ride at Disneyland”. Ah, Cranky. You should’ve asked. With all the rich, fancy people flying out of SNA that airport rarely ever sees the retrofit 737s. They’ve been meticulously keeping the ones with screens on that route ever since the retrofit started. You should try ONT if you want a retrofit. They fly there all the time. cbw – Well doesn’t that say something? If American thinks the fancy people need their in-seat videos in Orange County, then it goes against their statement that the new streaming video is better and it’s what people want. The big perk of elite status at one time was the possibility of first class upgrades. Those are G-O-N-E! The airlines got smart some years ago and realized they were virtually giving away first class seats, something most of us knew and prepared for. The nominal fee — $40.00 to $200.00 round-trip — was enough to manage the size of the list. The upgrade situation was so bad at one point that we upgraded a $1.00 round trip from Chicago to the West Coast. United was doing a “two-for-one-dollar sale” in which you booked one ticket and could take a companion along for $1.00 additional. United’s plan at the time was they would upgrade elites off “any published fare.” We received a call from United offering to refund my wife’s $1.00 fare, United knowing full well what was about to happen wanted my wife out of the upgrade cue. It didn’t work and we upgraded off a $1.00 fare!!! Today, the first class cabin is yield managed carefully. Most of us who are high mileage frequent fliers get Global Upgrades that are, essentially, worthless. The upgrades supposedly allow us to upgrade at the time of booking but there are “waitlists.” I have had about 20 of them been able to use about four. My elite status gives me access to “Economy Plus,” basically a pre-2000 coach seat, and 1K status allows me to board ahead of the “peasants.” I get mileage bonuses but…. well, when you travel this much those are benefits for your family. Had a bi-directional arrow between US and PEK, but the html monster ate it. Fond memories. I was a NW Silver Elite once upon a time when that would get me seats up front on >50% of my flights. Seems the goal with Delta is to sell those seats for miles. Granted, earning Skymiles is pretty easy so I don’t care if that’s the new game, I just hate when they call me a valued customer for flying +25,000 miles annually (and $ spend) but turnaround and give away the same perk to someone who has a credit card. Don’t tell anyone, but as a lowly silver on United, I’ve been upgraded about 1/4 of the time. That’s a pleasant surprise because i expected what Cranky experienced. I’m sure it depends on how elite heavy the route is that you’re on, but still its a pleasant surprise when your expectations are low. Awesome, SILVER HERE I COME! I wonder if it is because upgrades for silvers get processed at or closer to checkin so if stuff isn’t sold it goes to you? I suspect you’re not flying out of a hub regularly. I’ve found that if I’m on a routing that’s not a major UAL route and it’s a Tuesday or Wednesday, I land the upgrade frequently. It’s when you go head to head with the consultants and finance guys flying Monday mornings and Thursday nights between EWR and ORD that you lose out. I’m based at ORD; however, the upgrades tend to be on routes that are light on elite fliers – such as ELP or CMH. My next flight is ORD-BOS and I wouldn’t bet on an upgrade. I’d settle for economy plus!! I’m a Alaska MVP and scored a first class upgrade on a flight home from Honolulu recently. So the lower elite status at Alaska is worth it in my mind. So why can’t they do the silver polishing anymore? 737s can’t handle it? Most newer planes are made with carbon fiber, which can’t be polished like aluminum. Depending on the aircraft, some are all carbon fiber while others are partially made with it. Anyhow, the newer silver paint job replaced the polished metal to allow for consistency since you can’t polish a 787. Personally, until I hit 1K on UA out of ORD, I never felt like the status mattered much beyond entry level silver. Now it makes a world of difference. If only I didn’t have to neglect my family for the year to earn it. I have been a 1K on UA out of ORD for over 20 years. If you think it “makes a world of difference” now, you should have been a 1K before the “dark times” at UA… Sept 11, the Continental merger, and the bankruptcy. Back then, they had no cost 1K lounges (skinny-ed down United Clubs for 1K’s only) and 1K events (United sponsored all expense paid for 1k’s). Viewed in that context, the 1K status has been devalued from what it was. What’s funny about the perks at 1K is that I could care less about the free booze or snack box. It’s literally just them saying, “Thank you so much for being a value customer.” For all our complaints about the airline industry, I think all we really crave is appreciation. Those 1K events that UA used to have were certainly a way for the UA execs to say how much they appreciated us. In fact ALL of the UA top execs were at the events saying just that! Quick joke…. Question…What’s the difference between 1K and GS? No kidding. Was at a 1K event at Ravinia a number of years ago. It was absolutely fantastic. The 1K lounges were nothing special in the sense they were not walnut cladded walls with gourmet food and top shelf liquors. What they were was what we needed. A place to conduct business. A rep who understood what we needed and how to get it for us. Someone who appreciated our loyalty. Today by contrast, you walk into the United Club on the “C” concourse at ORD or anyplace at IAD or EWR and it’s a joke. United has sold memberships to anyone for anything, from credit cards to buying the right laundry soap. The intent of the clubs, to find a place to relax and conduct a little business, is a thing of the past. ORD “C” in particular is an embarrassment and United should be ashamed of itself. That’s what they offer anyone not a GS. I am surprised that anyone is surprised by the fact that basic status does not get you anything. Sorry, that gig has long been up and gone. But to say that benefits do not exist at mid-tier or elite tier is laughable and silly (same as the notion that SWA is any good, sorry i like to choose my seat. period..in advance) I am a Delta Diamond Med. and have almost never not been upgraded on a domestic flight and have global certificates for international travel if I needed to use them, though that is a hard track to crack as those upgrades are hard for any airline and any status. Is it worth it to have status? If you are flying out of a major airport and travelling frequently(i do), picking an airline can be an easy thing(Delta is very easy for me and has great connections) . Loyalty pays off. 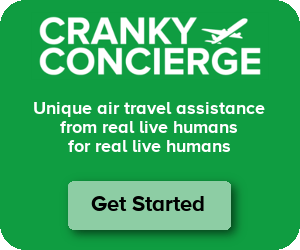 Apparently Cranky does not fly too much or far enough. When you make 24 international round trips(48 segments) of 10 hours or more and triple that domestic, the little perks really begin to add up, I mean really begin to add up. Instead of racking up a base amount of miles per trip, you see multipliers(especially when travelling Business(INTL) and he is right, the airlines have wisened up to the trade and made it harder to do old fashioned mile runs and other stunts to get status. Which DOES make sense, they want to reward their highest spending customers. khitomer359 – I don’t imagine anyone was surprised that Gold didn’t result in much. For me personally, there is the issue of not traveling enough to get high enough status to care. But the bigger issue is that I live in the LA area where we have a plethora of options. I’m not going to commit to any one airline because my options will vary depending upon the trip I’m taking. And I’ll always pick the best option for my schedule and price. If I lived in Atlanta or Charlotte or Detroit… well, I’d probably earn status but that’s exactly where status doesn’t matter for loyalty because other options are so limited. You are right about Gold status. Its better than no status but that’s about it. In the day Advantage Gold had real value. They would send us upgrade stickers good for any flight and the option to buy more. Of course back then, post AAdvanaage launch in 1981, AAdvantage Gold was all there was. And it was long before the digital age and cell phones and online booking. One thing I’m surprised that you haven’t learned, no part of DFW is in Dallas or Dallas County. Its all in Tarrant County in Fort Worth with stretches of one runway touching Grapevine. But Texans are still glad you brought Dorkfrst to DFW and even happier that you had a good time and said nice things about us. I believe that east side land was annexed into Tarrant County a few years ago when all oil and gas was discovered at DFW. As I recall it was a compromise decision based on royalties. The Dallas/Tarrant County line hasn’t changed since 1846. Just curious (and showing my ignorance). Are personal devices (or the signal to them) interrupted when the captain makes an announcement? I also received AA Gold through May for no good reason. I already had a trip booked with Avios and got my AA number put on that. Main Cabin Extra on a CRJ 700 is a big upgrade. I’ll take it. Well, with The Budget, the Wall, Fake News, Impeachment, Special Counsel, Black-Face, so-and-so is anti-whatever, Spring Break happenings, College entrance scandals, 737Max, Cargo planes, what would life be without getting to read a wonderful post on the elites and their perks. Life is good! Can’t believe you haven’t covered the 737max story cranky…. Frequent Flyer – Well, it’s all pretty much speculation at this point. I’m hoping to have something to write about for Thursday. The US has just grounded the 737 problem aircraft. Can a ‘grounded’ airplane be flown on a ‘ferry flight’ to another location. ?? A ‘ferry flight’ has no paying customers on board, just employees. Peter – I would assume so. For example, I see Copa 9905 flying from Miami to Panama City right now and WestJet 8989 flying from Winnipeg to Kelowna. One of the HUGE benefits of AA Gold is being able to standby for free on sale day flights. This has saved me a lot of $$ over the years being able to come home on earlier flights after business trips that wrapped up early or get out of town on an earlier flight when heading out on vacation etc. I’m United Silver now and have had Delta Silver a couple of times. It’s amazing how each time I’ve had it, how much the benefits have been watered down since the previous time I had it. The first time I had Delta Silver (2006), I got upgraded more than 3/4 of the time. That said, I still like having it even though the benefits are much weaker, and it has come in handy. For instance, when I visit my parents in Boise, it helps big time getting out of there. The airlines at BOI have shrunk their check-in space over the years and only have 2 or 3 people working the counter during the AM rush, so if you need to check a bag, the lines are always a mile long. That’s a minimum of 30 minutes you’ll stand there waiting. At least with Silver, I can get in the elite line and go straight to the counter. And even though I never expect a first class upgrade anymore, I do appreciate the Economy Plus upgrades. The only time I wasn’t able to secure one of those was on a Sunday Hub to Hub flight (DEN-IAD). I officially ignore the seat belt sign on any domestic US carrier. I was on LHR -> DFW on AA recently and the seatbelt sign was on for about 7 hours straight. Minor turbulence once during that time, which is why it came on. Not enough bumps to bother anyone, but bing, there is the sign. About 10 minutes past the last bump, the entire J cabin just ignored it. The US carriers, if you want us to obey and respect it, do the same. The reason they keep the 172 seat 737s out of SNA is the takeoff weight restriction with the short runway. They couldn’t carry a full load anyway. I earned Gold status a couple years ago and really enjoyed the half-off discount for purchases of Main Cabin Extra seats. My home town airport (FAT) doesn’t have many elites so I was better than 50% on upgrade to first. Now the Gold status doesn’t include this perk of half-off the rate for more leg room. Really nothing left for me in trying to keep my flights on AA.